Two weeks ago at MOPS we had a great speaker. She was encouraging us to start teaching our kids about money early and had lots of ideas about curriculums, special banks, and techniques. She also had lots of statistical evidence indicating that earlier teaching is better in this area. The most telling statistic was that students aged 13-17 showed very little change in behavior after taking a money management course, while students aged 8-12 made significantly 'better' choices as they grew. My oldest daughter is 7 so I decided I'd better figure out our plan soon! DH isn't big on allowance, but we've talked about it from a pure 'teaching finances' perspective so that may change soon. We'll see. We also don't have much time margin in our homeschooling to add a financial curriculum this year. I'm just trying to stay afloat with our basic math and language arts! We are squeezing in etiquette one evening a week. I decided that this savings plan would be a good way to teach DD#1 about saving, even if we're saving MY money and not hers. We decided to save for our Disneyland trip in 2015. We are planning to buy annual passes for our whole family and that will get spendy with 4 kids! 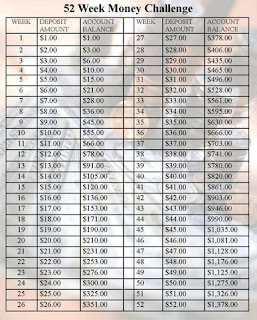 The idea is that you save $1 the 1st week of the year, $2 the 2nd week of the year, $3 the 3rd week of the year, etc. 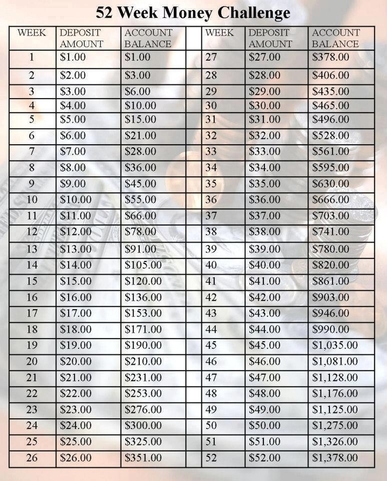 By December and weeks 49 to 52 you've established a habit of saving are saving $49, $50, $51 and $52 for the 4 weeks in December After 52 weeks you'll have saved $1,378! I thought it sounded awesome, but knew that there's no way I could save $50/week in December because of Christmas. Instead I decided to save whatever I could each week in the range of $1 to $52 and not duplicate all year. So far, so good! Every Sunday, after the weekend grocery shopping is finished, I put $10 in my summer produce savings and DD#1 and I put the rest into a coffee can with this chart inside. On January 6 we put in $5. On January 13 we put in $2. DD#1 dutifully crossed off the Week 5 and Week 2 rows, adding 5+2 = $7. On January 20 I only had a $5 bill and we'd already used Week 5 so I dug around in my wallet for $1 in coins. DD#1 wanted to contribute her own dollar (so sweet) but I said we'd save separately for her own goal. She had a great time crossing off Week 6, and adding the old $7 + $6 for the new week. She REALLY liked getting out all the money and counting it all up to $13. I expect she'll be giddy in a couple of months when she's counting in the hundreds and beside herself with glee when it's over $1,000. Or maybe that's just me. p.s. I found a website talking about this savings plan, too. You can sign up for weekly email reminders and encouragement.